Carnival Week is considered the annual national festival of the nation. 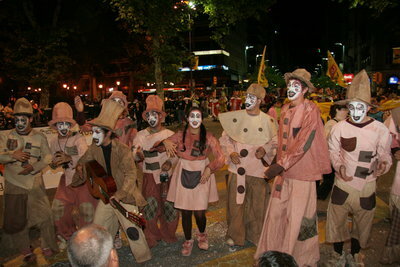 While the Carnaval extends to all the country with important events in several cities of the interior, the main activities are made in the capital of Montevideo. Homes and streets are grandly decorated, humorous shows are staged at open-air theaters, "tablados" or popular scenes (fixed and movable) are erected in the commercial districts. There are many competitions for murgas, black societies and lubolos, humorists, parodistas and magazines.The official launching of the Montevideo Carnival done with significant pomp and ceremony calling upon representatives of the national government, carnaval groups, and various local officials including members of the commissions responsible for the preparation of the celebration in each Zone of Montevideo. The Department of Culture is the main organizer of this annual national festival. Murgas: the voice of the city. A carnaval tradition of Spanish origin, whose role is to pass judgment with high content of humor and satire on the social and political events of the day. 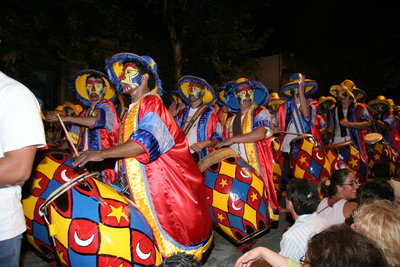 The parade is a popular party calls to be carried out during the Carnival in Uruguay.